and where CCTV systems are installed in non domestic locations, among others. 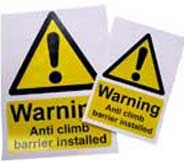 These Warning Signs are manufactured from UV stabilised plastic material are available bearing different text and images to suit the product installed. The images above show some of our stock signs. Signs are available in different sizes and structures. The semi rigid signs are ideal for use on walls or fences, where they can be attached with screws or cable ties, while our self adhesive flexisigns are designed for use on poles such as CCTV mounting poles, street lighting poles, etc. WARNING: use of perimeter security products could obviously cause injury to unauthorised intruders, which could in turn have implications for the owners of the premises under the Occupiers Liability Act 1984. 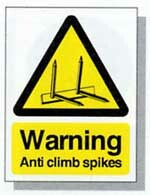 Note: Installation of any form of physical anti climb barrier at a height of less than 2 metres from the ground may be illegal and in all cases display of appropriate warning signs may be a legal requirement (where aggressive spiked type anti climb systems are installed, a higher minimum height may be required). Under the Data Protection Act, it is a statutory requirement that any commercial organisation using a CCTV system to record images, must display appropriate warning signage. Note: although the display of warning signs is not normally a requirement for domestic CCTV installations, owners of such systems should be aware that if their CCTV cameras cover any area beyond their own domestic property boundary (including any portion of a neighbouring property), their CCTV system should be registered with the information commissioners office.